The Railway Association of North Carolina (RANC) is a group of regional freight railroads, two Class I railroads and railroad-oriented suppliers operating in North Carolina. RANC promotes the benefits of freight rail to local, state and federal legislators and to the general public as a safer, more environmentally friendly, fuel-efficient and cost-effective mode of transportation that helps to remove truck traffic from congested highways and promotes economic development. 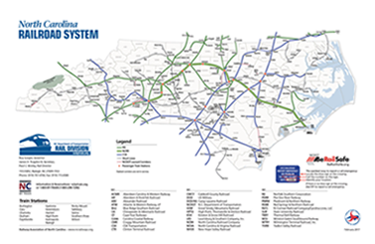 The Railway Association of North Carolina consists of 21 member railroads operating in the State of North Carolina. This number includes 19 regional railroads and two Class I railroads. We also have approximately 70 associate members, servicing our rail industry, who are our valued vendors and suppliers. Our Annual Conference is the largest of our quarterly meetings, which is held in late spring. We recommend attending this conference as many contacts are made. The Association takes a pro-active approach in dealing with current legislation and other issues concerning the rail industry in our state and nationwide. The Railway Association of North Carolina is a forum for our members to come together and share events and information to help promote the rail industry in our state. The categorized directory consists of our Associate Members, which the Railroad members use when placing bids for services and supplies. For further information or to join our association, please contact Michelle Hollowell at director@ncrailways.org. We look forward to hearing form you! The Railway Association of North Carolina, will be holding it's Annual Conference on Sunday, April 14-16th, 2019 in Pinehurst, NC. You can book your hotel room by clicking on the Carolina Hotel Registration link. To register for this event, please download the Registration Form and send back to Michelle Hollowell. We want to thank our Sponsors for helping to make this Annual Meeting a huge success! North Carolina Transportation Hall of Fame, Inc.